Buy You're A Lie on iTunes. 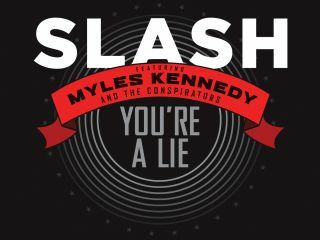 In the UK, Apocalyptic Love - featuring Slash and his bandmates Myles Kennedy (vocals), Brent Fitz (drums) and Todd Kerns (bass) - will be released on 21 May in exclusive Classic Rock Fan Pack form, providing a unique collectable package containing the studio album with bonus tracks alongside a specially created magazine with unseen behind-the-scenes content put together by Classic Rock. The Fan Pack format will also come with free gifts including a pin badge and artwork poster and will be available to buy via more than 2000 retail outlets on newsstands nationally as well as the traditional high street and online music retailer. The Classic Rock Fan Pack is available for pre-order now here. Roadrunner Records will simultaneously release the record digitally. The standard physical release of the Slash album will follow through Roadrunner Records on 18 June 2012. The full tracklisting for Apocalyptic Love is as follows. All the songs were written together by Slash and Myles Kennedy. Slash is also now confirmed for the UK's Download festival, which takes place on the weekend of the 8-10 June 2012. For more information and tickets please visit www.downloadfestival.co.uk.